Standing desks might never completely overtake the office chair, but they’re destined to become a bigger fixture of the average workplace floor plan. Demand for standing workstations in an office environment has grown over the last 10 years, and so has the evidence in their support: Studies continue to prove that standing more during a workday benefits one’s health and productivity. Learn why height-adjustable desks may change your employees’ routine for the better. The basic dangers of sitting are clear: When your body isn’t moving, it isn’t burning calories, leading to weight gain that could yield various physical and mental health problems. Many people try to counteract these risks by balancing their sedentary day jobs with exercise routines outside of work—jogging in the morning or hitting the gym at night, for example. Unfortunately, what we’ve come to think of as an “active lifestyle” still isn’t enough to keep long periods of sitting from doing their damage. The moderate-to-high-intensity movement we make during exercise is only one way for our bodies to consume energy. We spend most of our energy performing smaller and more routine movements: crossing a room, washing dishes, etc. Sitting at a desk for eight hours or more deprives your body of opportunities to burn these calories. One study found that people who exercised regularly saw reduced fitness levels for each extra hour of sitting, while another linked extended periods of sitting to increased risk of lung and colon cancer. Those who spend more working hours on their feet than in a chair will come out ahead in the health department. The extra burned calories add up over time, although not as significantly as you might think—blood sugar levels are the more important factor. Our blood sugar spikes after eating, and it returns to normal levels more slowly in inactive bodies, allowing the extra sugar to be turned into fat. Standing has been shown to speed up blood sugar stability. Workers have also reported feeling less shoulder and back pain after switching to a height-adjustable desk. Employers who invest in standing desks will see more benefits beyond their team’s improved health. There are links between standing and increased productivity—one study, for instance, found that sales professionals made 23% more successful calls after a month at standing desks than their sitting counterparts. When your body is in a position of action, you’re more likely to stay engaged with tasks and conversations than you are in a completely relaxed state. 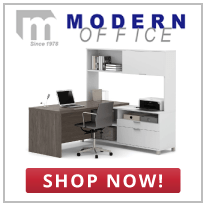 The Modern Office inventory includes a host of standing and height-adjustable desk offerings. Smaller standing desks are available for individual workstations, while adjustable tables are a good fit for conference rooms or open floor plans in which multiple workers might convene for moments at a time. Height-adjustable desks ease the transition from sitting all day to standing for longer periods—employees can go back and forth between sitting and standing positions without disrupting their workflow. Explore our standing desk selection to find the right furniture for your office environment. Placing an order could play an important role in improving your company’s overall health and efficiency.